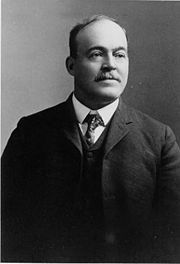 Edward Herbert Thompson (September 28, 1857 - May 18, 1935) was a United States born archaeologist and diplomat who is best known for his study of ancient Mayan culture. In 1885, he became U.S. Consul in the Yucatán, where he would remain for the next forty years. He worked extensively in the Yucatán Peninsula of Mexico, where he uncovered several novel artifacts. Thompson traveled extensively across the region and went to great lengths to associate himself with the Mayans. He was famous in his time for the discoveries that he made at Cenote Sagrado and elsewhere across the Yucatán. His work would serve to unlock ancient secrets and confirm Mayan legends. Much about Mayan civilization would have remained lost to the world without the lengthy labor of this dedicated archaeologist. Although Thompson had no formal training in either archaeology or in anthropology, he used the field-work techniques of both with great skill, so that his contribution to each far excelled those of many professional practitioners of these disciplines. Due to the development of photography, visual records of Thompson's pioneering work have survived. The colonization process in the Americas paid little attention to the cultural legacy of the peoples whose land was conquered, confiscated, or settled. Attitudes of racial and cultural superiority on the part of the Conquistadors with some rare exceptions meant that what unfolded was more often than not a form of cultural genocide. Only what had monetary worth was valued and that was valued less for any artistic merit than for that of its gold content, which could be melted down. The work of such men as Thompson also represents a crucial contribution to the discipline of history. Lack of knowledge of the civilizations that flourished in parts of the world other than the European (and North American) space have resulted in ethnocentric constructions of history that confirm the view that while Europeans were advancing in technology and science people elsewhere were standing still. Edward Herbert Thompson was born in Worcester County, Massachusetts. His parents were Josiah Thompson (1790-1855) and Louisa Houlton. His father, a builder, is said to have constructed one of the first vacation cottages at West Falmouth, Cape Cod, where the family used to take their holidays. As a boy, Mr. Thompson … sat in his snug New England home and read of the adventures of Stephens in Yucatan, descriptions of the old Maya civilization, and the legends concerning the sacred well at Chichen-Itza. Then and there he determined that his life-work should be the uncovering of the age-old secrets of the ancient city. In 1847, four years after Catherwood published his Incidents of Travel in Yucatán, the Caste War broke out and effectively prevented safe exploration of the region for approximately 60 years. Thompson would be one of the first to return to the area. It is now known that the Mayans had a sophisticated understanding of numbers and astronomy, which informed the construction of their pyramids. It was at the Cape that Thompson met and married Henrietta T. Hamblin, the daughter of a ship's captain. They married in 1883. Their oldest daughter, Alice Louise Thompson, was born January 2, 1885, in West Falmouth. In 1879, Popular Science Monthly published an article "Atlantis: Not a Myth" by Thompson in which he argued that the ancient Mayan monuments, which he had never seen except in books, were proof of the lost continent of Atlantis—an opinion which his later researches would change. The article attracted the attention of Stephen Salisbury III, scion of an American railroad baron and a benefactor of the American Antiquarian Society, who persuaded Thompson to move to Yucatán to explore the ruins on his behalf. (Willard says that the Society was anxious to have a "trained investigator on the peninsula," although Thompson had not formally studied archeology) Senator George Frisbie Hoar of Massachusetts agreed to help subsidize Thompson's efforts by recommending him for the post of United States vice-consul to Yucatan. It was understood, though, that Thompson would spend most of his time studying the remains of Mayan culture. Thompson arrived in Mérida, Yucatán, in 1885, with his wife, Henrietta, and their infant daughter, Alice and subsequently spent most of his life in Yucatán. Although he spoke only English upon his arrival, he quickly learned Spanish and also became fluent in the Yucatec Maya language. He also studied Maya legends and customs, as he attempted to better acquaint himself with the indigenous population. He traveled far and wide while in the region. In 1887, he was elected to membership of the American Antiquarian Society. Between 1888 and 1991, the Peabody financed work in Uxmal, Kabah, Sayil, and Labná. Henry N. Sweet, who was part of the team, kept a photographic record of the expedition. In 1891, at the request of the Peabody Museum, he was granted indefinite leave from the State Department to pursue his research. He officially retired from the State Department in 1909. He made a series of plaster casts of Maya sculptures and architecture, particularly from Uxmal and Labná, which were exhibited at the World Columbian Exposition in Chicago, Illinois, in 1893. With the help of the wealthy Alison Armour, in 1894, he purchased the plantation that included the site of Chichen Itza (founded around about 514 C.E. and abandoned in 1194). He rebuilt the hacienda, which had been destroyed in the Caste War of Yucatán. (The Caste War took place between 1847 and 1901 and involved a series of Yucatán revolt against rule by those of European descent.) For 30 years he explored the site, on behalf of the Field Columbian Museum, the American Antiquarian Society, the Peabody Museum of Archaeology and Ethnology at Harvard University and others. His discoveries included the earliest dated carving upon a lintel in the Temple of the Initial Series and the excavation of several graves in the Ossario (High Priest’s Temple). He was especially interested in the astronomical observatory, in the temple and in the ceremonial courtyard. The Castle (El Castillo) at the World Heritage Site Chichen Itza. Thompson discovered tools and building materials that helped to explain how the Maya had constructed their pyramids without the use of metal tools. He also found the Maya Œdate stone, later named the Tablet of the Initial Series, which functioned to decode the dates of Chichén-Itzá's classic period. Thompson is most famous for dredging the Cenote Sagrado (Sacred Cenote) (a natural sink hole, or well, some sixty feet deep) from 1904 to 1910, where he recovered artifacts of gold, copper, and carved jade, as well as the first-ever examples of what were believed to be pre-Columbian Maya cloth and wooden weapons. Local lore had it that sacrificial victims lay at the bottom, killed to propitiate the God of rain. In order to dredge the lake, he traveled to Boston where he learned how to dive using the equipment and techniques that were available at the time. Eventually he also recovered human skeletons from the site, which confirmed the stories he had heard about ritual sacrifice. Thompson shipped the bulk of the artifacts to the Peabody Museum. In 1926, following the publication of T.E. Willard's sensational book about Thompson's discoveries, in which he "greatly exaggerated" their value, the Mexican government seized Thompson's plantation, charging that he had removed the artifacts illegally. They "filed suit for 1.3 million pesos." The Mexican Supreme Court finally, in 1944, ruled in Thompson's favor. Thompson, however, had returned to West Falmouth in poor health and died in 1935, so the property reverted to his heirs. Many and many a night, under the gorgeous moonlight of Yucatan or by some cozy fireside in the States, I have listened entranced, as the hours glided by, to the true tales of Don Eduardo tells of his experiences or of the customs and folk-lore of the country. I know intimately this lovable, modest, blue-eyed six footer, this dreamer and adventurer, gray-haired now but still with the heart of a boy. I know him better, perhaps, than does any other man, and if I do not write down the things he has told me they will never be written, for Don Eduardo will not do it. Therefore I have asked and received his permission to write, from memory and from his notes and my own, this book, which he has read and corrected. Before my driving dress had been more than half removed I plunged my chilled fingers into the dripping pouch and drew out beautiful embossed rings I had collected perhaps twenty or thirty small bells of copper, and several balls of pure gold repoussé and gold filagree, of exquisite design and craftsmanship … This was but the beginning… At the end of the day we had piled up over two hundred of these curious specimens of Mayan workmanship…. After a period of intense and dangerous warfare that served to prevent extensive exploration, Edward H. Thompson entered the Yucatán determined to uncover the secrets of the mythic Mayan civilization. He was the youngest consul ever to venture into Mexico with his immediate family near the end of the nineteenth century. Because he decided to intermingle with the local indigenous populace, Thompson was afforded advantages over less hospitable archaeologists in the region who kept their distance from the people. In his time, Thompson's findings rocketed him to fame and helped to establish a much firmer understanding of the ancient Maya. He was dedicated to his life's work and went to great lengths to better understand this remarkable and unique civilization. He is best remembered for his work on the Cenote Sagrado. The hacienda he rebuilt on the plantation he purchased (which included the site of Chichén-Itzá) now serves as the Hacienda Chichen Hotel. The length of his sojourn among the Mayans, his technique in learning language and of immersing himself in Mayan culture resemble the field work techniques of anthropologists although few spend as long a period as he did engaged in their research. In 1913, the Carnegie Institution financed a restoration project archaeologist at Chichén Itzá. The ruins were mapped and some were restored. In 1988, Chichén Itzá became a UNESCO World Heritage Site. Without Thompson's role, this "patrimony of humanity" may well have remained permanently lost. Only by the commitment and dedication of such scholars as Thompson can ancient civilizations whose stories have been by-passed or neglected or even trampled on by the passage of history be given their voice once more. Through the work of men such as Thompson some of the ethnocentric tendencies in historiography can be critiqued and challenged. Edward and Henrietta had eight children. Alice Louise was born February 1, 1885, at Falmouth. Edward Josiah was born September 16, 1886, Merida, Mexico. Ernest Hamblin was born May 24, 1888, at Merida. Mary Abbie was born January 28, 1890, at Merida. Margarita was born December 11, 1891, at Merida. Abbie May was born September 5, 1894, at Merida. Stephen Salisbury was born June 12, 1896, at Merida. Vincent Armour was born October 6, 1898, at Merida. ↑ Different sources give various years for his birth: 1956, 1957, and 1960. ↑ 2.0 2.1 Evan J. Albright, Edward H. Thompson (1857-1935) and the Treasure of the Sacred Well, Yucatan Adventure. Retrieved August 25, 2008. ↑ T. A. Willard, The City of the Sacred Well (New York, NY: Grosset and Dunlap, 2004, ISBN 9781417976751), v.
↑ 4.0 4.1 Jeanine Lee Kitchel, Edward Herbert Thompson. Retrieved August 24, 2008. ↑ American Antiquarian Society, Members. Retrieved August 25, 2008. ↑ Reed College, 1888-91 Sweet & Thompson. Retrieved August 25, 2008. ↑ UNESCO, City of Chichen-Itza, World Heritage Center. Retrieved August 25, 2008. ↑ Hunbatz Men, Secrets of Mayan Science/Religion (Santa Fe, N.M.: Bear & Co., 1990, ISBN 9780939680634), 34. ↑ Rootsweb, Ancestors of Ernest Hamblin Thompson. Retrieved February 26, 2013. Ceram, C. W. Gods, Graves, and Scholars: The Story of Archaeology. New York, NY: Vintage Books, 1986. ISBN 9780394743196. Keen, Benjamin. The Aztec Image in Western Thought. New Brunswick, NJ: Rutgers University Press, 1971. ISBN 9780813506982. Men, Hunbatz. Secrets of Mayan science/religion. Santa Fe, NM: Bear & Co., 1990. ISBN 9780939680634. Shane, Orrin C., and Clemency Chase Coggins (eds.). Cenote of Sacrifice: Maya Treasures from the Sacred Well of Chichen Itza. Austin, TX: University of Texas Press, 1984. ISBN 9789681630744. Silverberg, Robert. Great Adventures in Archaeology. Lincoln, NE: University of Nebraska Press, 1997. ISBN 9780803292475. Stephens, John Lloyd, and Frederick Catherwood. Incidents of Travel in Central America. New York, NY: Dover, 1969. ISBN 9780486224046. Retrieved August 25, 2008. Thompson, Edward Herbert. The High Priest's Grave, Chichen Itza, Yucatan, Mexico. 1938. Retrieved August 25, 2008. Willard, T. A. The City of the Sacred Well. New York, NY: Grosset and Dunlap, 2004 (original 1926). ISBN 9781417976751. History of "Edward Herbert Thompson"
This page was last modified on 22 September 2017, at 20:36.